COUNCILLORS have hit out at “irresponsible” highway bosses for failing to repair a road and paths ahead of the big light switch off. Geoff and Linda Williams, Lib Dem councillors for Nethermayne ward, want to see all highways defects sorted out before Basildon is plunged into darkness between midnight and 5am. After months of talks, Essex County Council will turn off 70 per cent of the streetlights across the borough today. The Echo revealed last week lights will remain on for the time being at Five Links, Felmores, Langdon Hills, Chalvedon, Pitsea?s 1,2,3 estate, and Craylands, following pleas from Basildon Council over crime. Councillors had called for assurances roads and paths would be fixed to cut the risk of accidents for motorists and pedestrians. Whatever Happened To The Rayleigh Gas Company ? The kerb problem affecting both pedestrians and road traffic, which I have previously commented on, is now reaching its nine month anniversary, despite repeated follow-ups via various routes. Has Cllr Bass cancelled repairs as well as safety improvements? Any bets on getting to the 12 mth mark? Does turning off street lighting in 30 mph restricted roads affect speed limits between midnight and 5am? The following legislation now seems unclear in this respect. The conclusion in the final paragraph clearly states that three or more lamps must be throwing light on the carriageway. Also, as there is no lighting for 5 hours should 30 mph speed limit-repeater signs be installed retrospectively. Section 82(1)(a) (of the Road Traffic Regulation Act 1984 (RTRA 1984)) defines a restricted road in England and Wales as a road which is provided with “a system of street lighting furnished by means of lamps placed not more than 200 yards apart”. Section 81 specifically makes it an offence for a person to drive a motor vehicle at a speed of more than 30 mph on a restricted road. 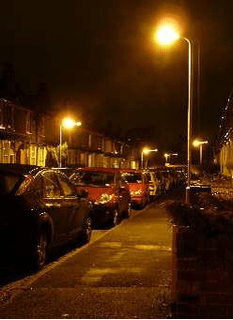 As set out in paragraph 45, it is generally recognised that a ‘system’ of street lighting could be three or more lamps spaced not more than 183 metres apart. However, street lighting (for the purposes of determining whether or not a road is a restricted) is not necessarily limited to street lamps, but may extend to lighting provided by authorities or parish councils. Direction 11 of The Traffic Signs Regulations and General Directions 2002 (TSRGD 2002) defines the requirements for the placing of speed-limit repeater signs. This states that speed-limit repeater signs cannot be placed along a road on which there is carriageway lighting not more than 183 metres apart and which is subject to a 30 mph speed limit. The Department will not make exceptions to this rule. This means it should be assumed that, unless an order has been made and the road is signed to the contrary, a 30 mph speed limit applies where there are three or more lamps throwing light on the carriageway and placed not more than 183 metres apart. Very interesting question. Though I suspect that it doesn’t affect the speed limit – Ron Oatham mentioned to me recently that when he moved to Rayleigh, circa 1960, all street lights went off at midnight. Do you have a link to that information Greenbelt? Given that most of the people that speed are anti social halfwits the lights being on or off will make no difference. They will still speed. Interesting argument greenbelt, but I don’t think it would wash because streetlamps don’t give out light during the day either. No Sean, but during the day you can see they are lamposts.